At 2012 is off and running! Today is my first day at work and it started with a bang, we pushed out a new version of our ecommerce web site at kingschools.com and over all even with a few speed bums and some tense times it all went well. I really can’t take any credit at all for the success as the rock stars around me did all the heavy lifting. I hope the rest of the year will go as smoothly! Now on to the obligatory list of goals for the year. My brother-in-law Ross Rizzo did a great smart thing to help all of us in the family to make 2012 the best it can be. He send a email to everyone in the family asking for two lists of goals. One list was to be the reasonable goals and the other was to be less reasonable. I decided to publish my list as I am a firm believer in failing or succeeding in public so you stay motivated and others can learn from your actions. I will post about how I do on each of these but please feel free to comment with suggestions. I hope each of you will take some time to think what you would like to accomplish this year and then make a plan and do it! OK I know I have let this space go a little dark, I have recently taken a new job at King Schools as the Director of Software Development. King Schools provides aviation education and information and there largest mechanism to deliver this content is software. The company has been around so long now that software delivery of educational content is the third mode of delivery. John and Martha King started King Schools in the 70s and have enjoyed great success and much recognition for the quality and enthusiasm for flying. I am not a pilot but my father was a Naval aviator and many of his friends were and are still quite involved with the industry so I have grown up around this industry and I am constantly amazing myself at how much I know about the industry though just pure osmosis. The software environment is a mish mash of software platforms and architectures like many other companies that have been in business for a long time. I have been trying to determine the best way forward and I am feeling like I am getting a handle on things. We are moving forward with developing new delivery frameworks with a combination of Entity Framework, MVC, some WCF and all UI in HTML and HTML5. This all good for me as I am up on all of this except for the HTML5 canvas element with is where I want to go with a lot (not all) of the UI rendering. I look forward to seeing what we are going to be able to do with it in the long run. I am sure I will start to blog more often again now that I think I have my head wrapped around this place, I would like to know what anyone who stumbles on this thinks of UIs rendered in HTML5 using the canvas element epically if you have any pit falls I can learn from. 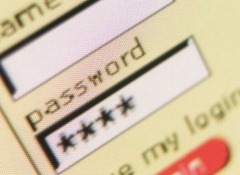 How does your password hold up? I heard an interesting story yesterday on KPBS about password strength and ways to make passwords easy to remember but still quite hard to crack. The concept is simple use a short easy to remember password and then add a number of the same charter or a pattern of charters. Any example would be “Do!t……………………” or “Do!t<!><!><!>” you can see both are a variant of “DoIt” and then a pattern of charters after. In the story they point you to a online tool that can measure the time it would to take to crack a password. You can see this tool at https://www.grc.com/haystack.htm, I have validated that it dose not send any data back over the internet so while I would normally say never enter your password to test it in to a page this page it is ok. I hope it will help you make and use more secure passwords in the future! Comments Off on How does your password hold up? 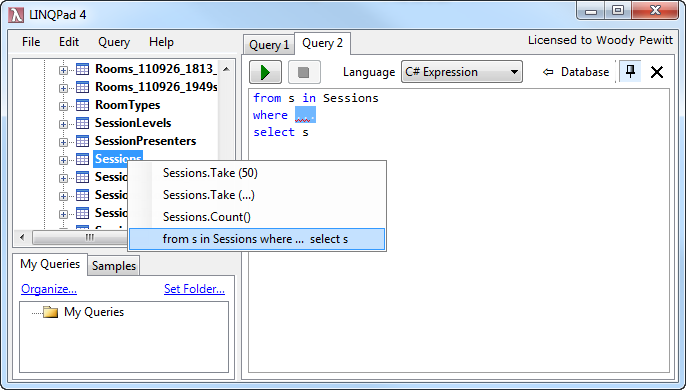 I can’t believe I have missed this tool for so long but just today while starting to create some services for SoCal Code Camp I found the LINQPad tool and wow. If you have not taken a look I would suggest you do so. You can see from this screenshot I have connected to the SoCal Code Camp data base and right clicked on the Sessions table. I have already selected the “from” menu but am showing what the right click menu looks like. I truly suggest you check this tool out if you are going to be working with LINQ it’s a great learning and prototyping tool. If you have used it I would like to know what you think! I finished assembling my new standing desk on Friday so I did some time at the desk over the weekend but Monday was my first day. By the end of the my feet were sore but at the same time I felt much more energetic. Tuesday I went to the DevExpress office witch is a two hour train ride and then sat all day, I was fidgety all day. I could not wait to get back to my home desk. So today I did the whole day in front of the new desk and except for the need to get my new eye glass prescription filled I am 100% satisfied with the setup! I had commented in my video when I put together the desk about the crank not reaching the front of the desk. I ordered another piece that goes from the base to the crank (in the directions the part is identified as “0.12”). Flex Table was super, they got me the part the next day and today the entire desk is 100% operational, I just had my oldest boy (Max) crank it all the way down and back up. At the end of day two once again my feet are sore but no more then if I had been walking all day. I will not be home all next week while I am at TechEd but I will miss my new setup. I will post an update after I have worked a few days in a row in front of the new desk. To get back the the eye glasses thing I got a new prescription in January but I guess while sitting down I would lean in to my screens. With the standing position I can’t lean in as easily and while I have pulled all my screens closer to me on the desk it’s still not enough so I hope the new glasses will help. It will be the first time in more then 11 years since I have gotten new glasses I am am sure it will be strange for me. I got my base from http://www.heightadjustableworktable.com way sooner then I had expected so last night I put it together and setup my new desk. I made a video of the unboxing and my assembly, I am sorry for the quality but I hope you ever put one of these together it will help you. So greatly inspired by my fell San Diegan Mitch Wagner I have decided to take the plunge and get a standing desk. You can read his experience starting with his post Getting ready to try a standing desk it seams to have worked out well for him and from the other reading I have done it has been good for a lot of people. I ordered the Black Manual Base desk base from Height Adjustable Work Table. If should be here early next week, I could have gone for a nice simple solution that Mitch did with just adding something on my desk to give me the extra height. The problem is I don’t have room in my office to allow me to have a temporary sitting place and I use three monitors so the thought of moving them was a little much. I was a little cheep by getting the manual base and not the electric base but I can use the Electric Upgrade Kit for the same price differential (ok except for additional shipping) as getting now. The only problem I have to solve if I can attach the desk draws that I currently have on to this new base. I will repost back as I build and move to the new setup but if you use or have used a standing desk I would like to hear your experiences. Today on my walk (yes I try and walk every day, I fail most days) I turned my Zune to This Developers Life podcast that I have had queued up for about 3 months. Let me fill in a little when I walk I typically listen to Hansel Minutes and .Net Rocks or some loud hard pumping music if I don’t feel like walking. I had heard some good things about This Developers Life all round but I had always thought the time was better spent trying to learn something or at least getting exposed to things that I would normally get exposed to. What got me wright this blog post was how in just the first show Rob Conery did a fantastic job of bringing to life experiences that every developer at some level has experienced. I am a fan of the show This America Life but with This Developers Life it hit a lot closer to home and therefore is more interesting to me. If you have not gotten a chance to tune in to This Developers Life I would suggest you do. The DevExpress team including myself will be going to Atlanta for TechEd (May 16th-19th). I will also be going early for the INETA Community Leadership Summit on Sunday May 15th. If you are going to be at the Summit look for me or if you will be at TechEd make sure you stop by the DevExpress booth and say hello. Comments Off on Going to TechEd? Today I was introduced to a feature of Outlook that has been around since Outlook 2007 but some how I missed it. 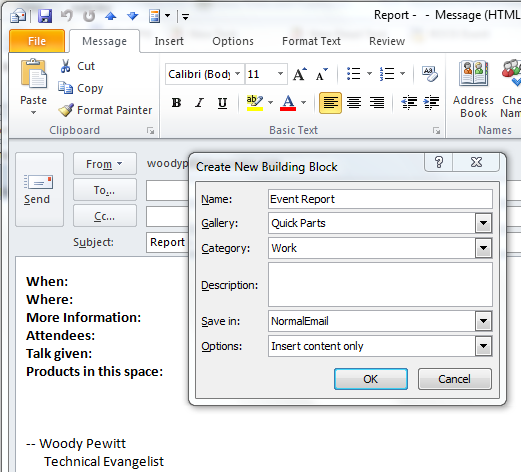 The feature (as the title says) is called Quick Parts and it allows you to bring in blocks of predefined text in to a email quickly. So if you are adding the same block of text to a email over and over this is for you! I really wish I had found this a long time ago I can’t say how many time before a SoCal Code Camp I wind up answering the same type of questions. So why have I never seen this feature? Will the truth is I was most likely asleep at the wheel at some point but it’s also quite hidden. 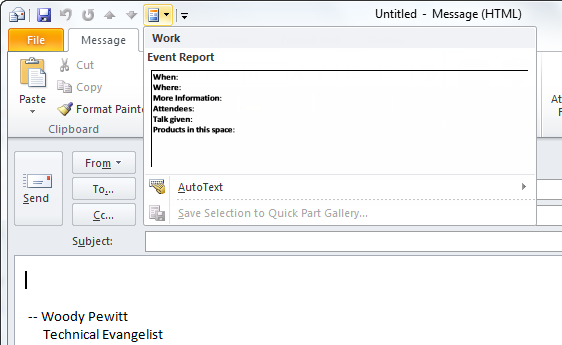 As you can see from the image above (click to see full size) the “Quick Parts” drop down is on the Insert tab (seen in red) in Outlook and I don’t know about you but I don’t spend much time looking at anything other than the Message tab. You can also see I have added it to the Quick Access Toolbar at the top (seen in dark yellow) so I don’t have to switch to the Insert tab to add or create a Quick Part. You can see in this image that I have opened a email and am adding a “Building Block” in the Quick Parts Gallery (not sure what that implies but that is for another day). I then added a Category of “Work” where I want the block to reside. Now I can use this as a template for an event repost that I use from work. To use this new Quick Part all I have to do is open a new email and either go to the Insert tab and press Quick Part or for me press the Quick Part button that I have added to my Quick Access Toolbar. I hope this will help you as much as I am sure it will help me for more information you can see the blog post Living in Outlook: Using Quick Parts by the Outlook Team.